[With] A Memoir by her Nephew J.E. Austen-Leigh [with] Lady Susan and Fragments of two other unfinished Tales. New Edition. [Complete set of the Steventon Edition.]. 6 vols., 8vo., with 5 engraved frontispieces, engraved portrait of the author and full-page facsimile, frontispieces and titles mildly browned; most attractively bound in contemporary niger half calf, marbled boards ruled in gilt, back with five raised bands ruled in gilt, second and third compartments ruled and lettered in gilt, all other compartments elaborately ruled and tooled in gilt, marbled edges, marbled endpapers, an unusually well-preserved, bright, clean, crisp set. A bright set, comprising Vol. I: Sense and Sensibility (1882); Vol. II: Emma (1882); Vol. III: Mansfield Park (1883); Vol. IV: Northanger Abbey [and] Persuasion (1885); Vol. V: Pride and Prejudice (1881); Vol. VI: Memoir, Lady Susan, Fragments (fifth edition, 1883). The five frontispieces are by Greatbatch after Pickering from the original Standard Novels issues of 1833; the portrait and facsimile are from the 1870 'Memoir'. HANDSOME SET OF THE LAST STEVENTON EDITION, AND THE LAST EDITION OF AUSTEN PRINTED BY BENTLEY BEFORE ACQUISITION BY SMITH ELDER IN 1898. 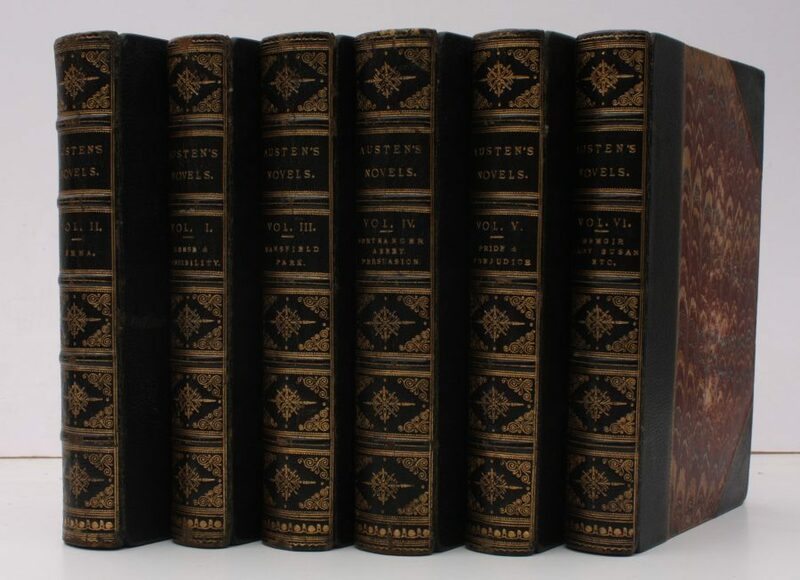 THE 1882 ISSUE WAS LIMITED TO 375 COPIES OF EACH VOLUME SOLD ONLY AS SETS; the present set contains three such volumes (all with half-titles as issued); the remaining three volumes are reissues. Gilson, D13 et seq.